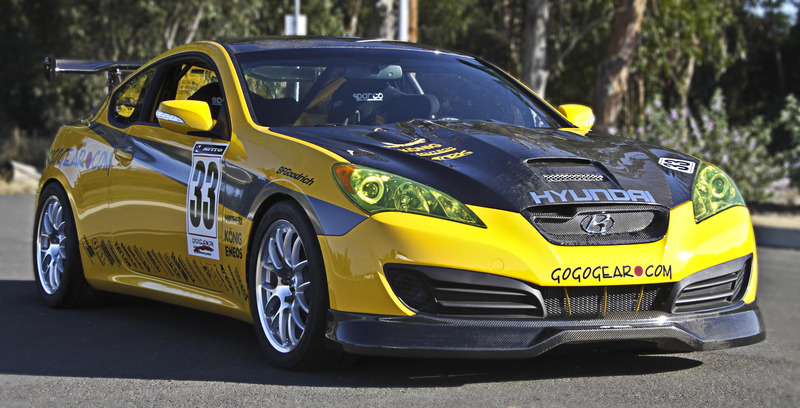 Hyundai teamed up with Gogogear Racing to develop a high performance racing car, which will be unveiled at the 2010 SEMA Show. 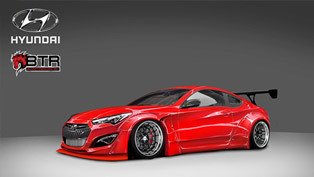 It is based on Genesis Coupe, and the racing version offers great reliability and high-end performance capabilities. 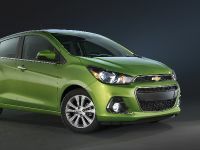 Additionally, the bright yellow paint scheme was designed in conjunction with Hyundai's California Design Center. 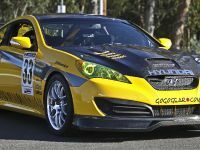 "The Genesis Coupe is designed to convey that Hyundai can not only match the best from Asia, Europe and America, but beat them,", comments Ali Arsham, owner, Gogogear Racing. 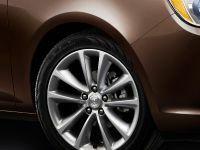 "With its potent V6 engine and rear drive chassis, the Genesis Coupe has the ability to beat the current top guns that feature turbocharged four-cylinder engines and front wheel drive. 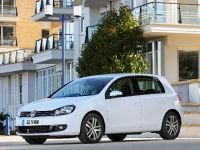 It has ample power, terrific handling, and great reliability that become even more potent with the modifications we've planned. ", Arsham added. 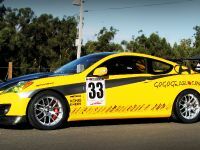 The racing version of Genesis Coupe will take a part in the U.S. Touring Car Championships in 2011. 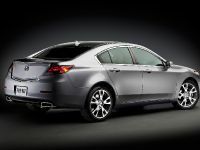 Hyundai Genesis coupe is powered by 3.8 liter V6 mated to a 6-speed manual transmission and RWD. 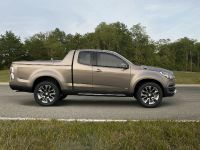 The upgrades include boosting the engine to 330hp and 280 lb-ft of torque. 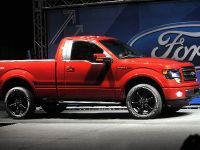 The results are achieved thanks to CAI, Magnaflow exhaust system and ARK Performance headers. Furthermore, Gogogear Racing mounted Moroso accumulator for better lubrication of the engine and oil cooler. 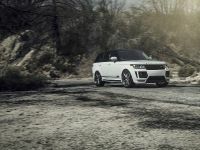 Among the other performance parts, there are Ground Control suspension tuning with ARK Performance shocks, springs, coilovers and QA1 bearings. The car also has a light weight Spec racing clutch. 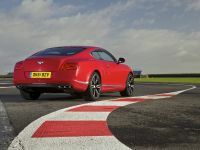 StopTech brakes and Hawk racing pads will ensure extreme stopping power. 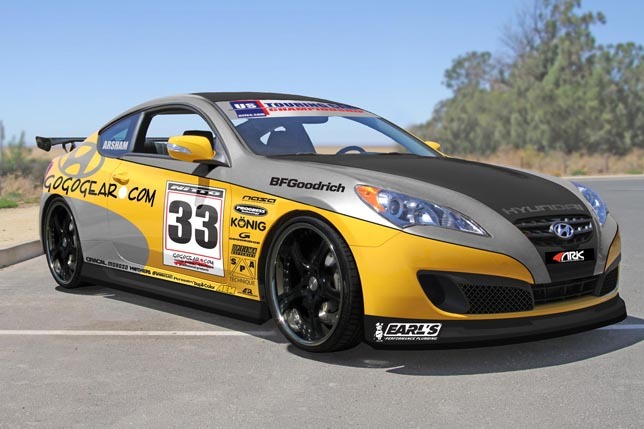 Hyundai Genesis Coupe Race Car stands on Konig lightweight wheels and BF Goodrich R1 street legal tires. "The BF Goodrich R1 tires are a key ingredient towards achieving the 1.4 Gs of cornering force that we are aiming for," said Arsham. Last of the upgrades is an Optima Battery to ensure reliable starting and electrical power and was relocated to the rear with the help of a Taylor Vertex kit for improved weight balance. 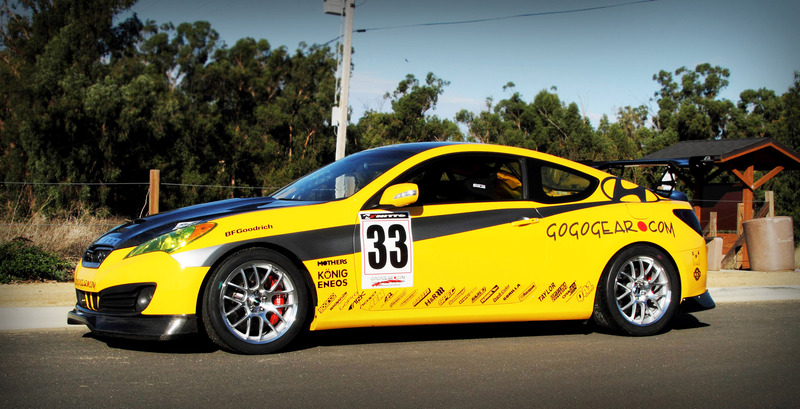 The exterior of Gogogear Racing Hyundai features increased aerodynamics by adding an APR rear wing and an ARK Performance body kit. 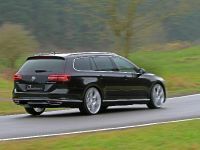 There is also a carbon fiber roof for lowering the center of gravity. 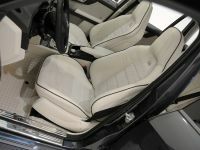 The interior includes Sparco race seats and seat belts, a full custom Metric Motorsports roll cage, a SPA Techniques fire suppression system and a two-way radio. A RacePak IQ3 data logger dash supplies critical information and lap times to the driver. A Linear Logic Scan Gauge II further notifies the driver of secondary engine parameters. 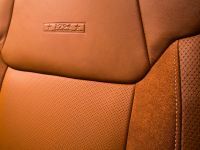 The interior will be treated to Dupli Color's Daytona Yellow paint job to match the exterior.